Grant Period: The 2018 cycle is now closed. Please check back in fall for 2019 application dates. The New Hampshire Partnership for Schoolyard Action Grants, a collaboration that supports schools wishing to link the school curriculum and their students with the local environment, is pleased to award action grants to these schools. Interested in pollinator activities? Students of all ages can put their knowledge into practice by participating in building a pollinator habitat or taking other activities to support pollinators both inside and outside of the classroom. The New Hampshire Partnership for Schoolyard Action Grants, a collaboration that supports schools wishing to link the school curriculum and their students with the local environment, is pleased to award over $6,000.00 in action grants to these schools. New Hampshire Project Learning Tree is pleased to announce the winners of the 2016 Outdoor Classroom Special Fund grants. Each winner will receive a $250 grant to develop or improve outdoor classrooms for their students. These recipients received their checks at the New Hampshire Project Learning Tree Annual Celebration on May 15, 2016. New Hampshire Project Learning Tree is pleased to announce the four winners of the 2015 Outdoor Classroom Special Fund grants. Each winner received a $250 grant to develop or improve outdoor classrooms for their students. The Outdoor Classroom Special Fund was started to honor the leadership of Esther Cowles, Executive Director of NHPLT from 1997-2011. Ledge Street School, Nashua, NH: The Ledge Street School will be adding a solar water pump and motion camera to their frog pond. The water pump will keep the pond water circulating, improving habitat for the tadpoles they raise there. The motion camera will enable students in all classrooms to watch the paid of Red Tail Hawks that visit and bath in the ponds. “I see smiles on their faces and wonderment in their eyes as they discover something new in the outdoor classroom. Developing a plan and/or lessons to integrate the schoolyard studies into curricula. Teachers and students working with a landscape architect to design a schoolyard plan. Planting native trees, shrubs, vines or perennials to provide wildlife food or cover. 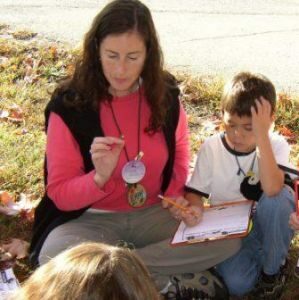 Supplies (beyond typical school supplies) needed to participate in a citizen science project such as Cornell Lab of Ornithology’s Project Feederwatch, Birdsleuth, or Yard Map, or New England Signs of the Seasons phenology project. Building ponds or other water sources such as birdbaths or fountains. Installing bird feeders and feeding stations. Building small structures that support outdoor learning. Finish project within 1 year of the award. Attend a workshop of all grantees on March 9, 2019. Submit a final summary that includes expenditures, pictures, accomplishments, and the number of participants in the project. Visit or participation of the U.S. Fish and Wildlife Service, NH Project Learning Tree, NH Fish and Game or NH Audubon staff. Sharing your project with others at a workshop or conference. Teachers, other educators and community members working in cooperation to develop an outdoor classroom. Applicant must have been trained in Project Learning Tree or have someone on the team who has been trained. We are available to help plan and implement your schoolyard projects. Class visit from a biologist. Integrating schoolyard studies with the curriculum and standards. Professional Development with curricula and schoolyard planning. Professional Development and wildlife information resources. Visit NH Fish and Game website for details. Include the cover sheet and attachments that illustrate and support your proposal.